It seemed like it would never end, but winter is finally drawing to a close. Which means you can chuck your heavy scarves into the back of wardrobe and finally start digging out lightweight pieces. 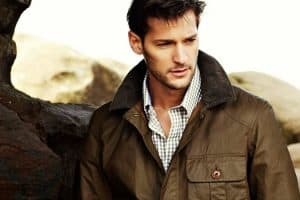 Of course, that occasional sunshine comes cut with gales and rain, so the most important investment you’ll make this season is a transitional coat. Here’s our pick of the best ways to stay warm and dry in style. If you’re looking for a budget piece, go for something low-key that will keep you warm but can also be layered. Jersey is lightweight, so you won’t overheat, and this bomber’s black colouring means it goes with anything you want to sling above or below. The gold accents punch up a pocket-friendly buy and add some sun-catching shimmer, should it ever actually appear. In essence, this is an investment without the price tag – a jacket that you’ll look to every day throughout spring and then dig back out to layer up over winter. Available from ASOS, priced £20. Weirdly enough, the anorak was back in a big way for SS16. Lou Dalton, Wooyoungmi and a fair few others looked specifically to those disposable Pac-A-Macs that we’ve all frantically hoarded before festivals, but gave it a fashion-forward makeover. From bold prints to complete transparency, designers got creative when reinventing the waterproof favourite, but this classic black version nails the longline, slim-fit staple. Available at Rains, priced £89. When you think of SS16 trends, you think of the 1970s. And when you think of the 1970s, you think of suede. The fabric is having a major moment; versions on the runway were embellished and teamed with flares and printed shirts, and the high street has picked up in a big way. However, real suede plus unpredictable weather equals a waste of this month’s rent cheque. Faux suede is much more sensible and still on-trend, especially when it comes complete with gathered cuffs and perforations, such as this Zara option. The lightweight polyester lining makes it more spring-friendly than the real deal too. Lifted from ASOS’ ‘Reclaimed Vintage’ range, the knee-length cut of this duster jacket is flattering on just about anyone. Khaki taps into fashion’s current obsession with all things green and it’s also a good way to nod to the military trend without buying yet another piece in ubiquitous camo print. Smart, stylish and wearable – this could easily become a wardrobe staple. If you’re going to buy luxury you should a) steer clear of trends and b) look for things that will increase in value. This parka is the purest example of a piece that doubles as an investment – just months ago, Raf Simons sold his parka archive and commanded up to £20,000 per piece. The fit of this is excellent, the style is classic and the casting photos that adorn the back add a unique element that will catch the eye of even those who know nothing about fashion. Plus, with his 20+ years of design experience, Simons has established his name as one of the strongest in menswear. So, if you’re lucky enough to have the cash to invest, best to do it with Raf. Available at Mr Porter, priced £1,375. The bomber’s earned its spot in every wardrobe. But that also means an ordinary MA-1 tends to not stand out. Our Legacy’s take swaps nylon for on-trend fleece, for something as warm as it is unique. Then when you feel like making a statement, it flips inside out to reveal a safety orange shell. Looking for a coat you can wear to the office as well as the bar? Reach for a trench. The classic spring coat, the best are lightweight but waterproof with minimalist styling, so they work from commute to the weekend. Aquascutum has claim to the first ever, but the brand’s current range is more suited to street style wars than the actual trenches. The Voyager is designed for the man on the move, packing down into a pouch to stow when you’re jumping between public transport, the streets and the office. Available at Aquascutum, priced £250. Since wool and rain aren’t the best of pals, Balenciaga has reworked the classic overcoat in neoprene – better known as the stuff wetsuits are crafted from – to make your winter staple ready for wetter weather. 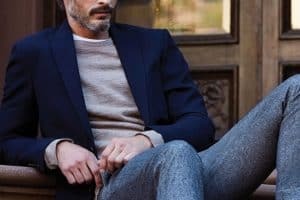 The single-breasted cut means an open neckline to showcase what lies beneath and the notch lapels are slim enough that they won’t drown you. Meanwhile, the minimalist design is timeless enough to transition through several seasons. Available at matchesfashion.com, priced £575.